The lightboard – making magic Safyr glass; lumo markers; black fabric; LED striplighting – it has all the features of magic making. And it does seem magical when it is in action. Meet our newest teaching tool – the lightboard. Custom built for the Centre in Innovation in Learning and Teaching (CILT) by UCT’s Mechanical Engineering Department’s construction and electrical workshop in 2015, this lightboard required many ingredients to make the magic happen. With the blessing of Mechanical Engineering head, Prof Knutson, engineering technicians Horst Emrich and Richard Whittemore designed and built the lightboard over several months to specifications supplied by CILT. There were issues around sourcing the correct materials including the crucial decision about what kind of glass would work? (Eventually, specially thickened safyr glass was selected). Other taxing issues included how to stabilize the huge contraption. It weighs over 60kg and stand more than 2m high. (Horst built special stabilising legs.) How to make it moveable since we did not have a large enough studio to store it? (Handles and very sturdy wheels with parking brakes!). How to ensure even lighting across the whole pane of glass? (Glueing the LED strip all around the perimeter). First created by academics from Northwestern University in Illinois, USA who were making video lectures for Massive Open Online Courses (MOOCs), the academics shared the ‘recipe’ online as an open source design. It has been replicated in various online learning environments – here is an example from an Australian university MOOC (you can see the lightboard in action towards the end of the video) – and it can enhance online teaching, especially where students need to watch teachers work through problems step-by-step. UCT’s MOOC Climate Change Mitigation made in 2015 used the lightboard for some lectures and academics from UCT’s Statistics department have found the lightboard to be an invaluable teaching tool. They incorporate it into many of their online course lectures. In September, the Stats educators filmed additional material for their existing online Stats 1000 course – mainly working through tough test questions which students have been struggling with. Veteran online instructor, Dr Leanne Scott inducted two of her tutors in the magic of how to use the lightboard for teaching. For all its light and magic, the lightboard is not an impromptu teaching tool – it requires special set up (lighting is quite tricky) and meticulous planning, and practicing how to teach with it takes some time. But watching the results in online courses definitely indicate that for some concepts, the lightboard is an excellent resource for online teaching. 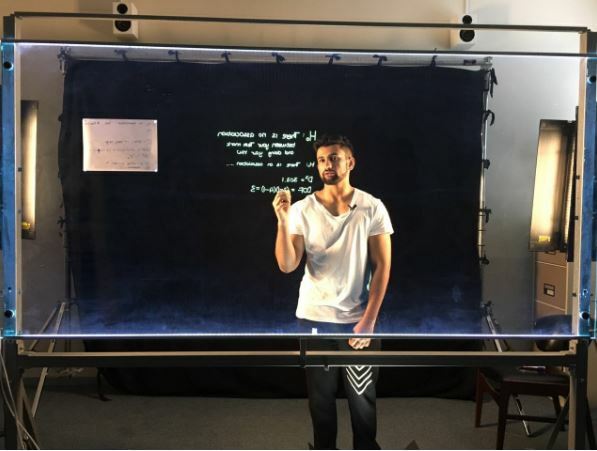 For a demonstration or to find out about CILT’s lightboard and filming rates, contact the head of Digital Media, Nawaal Deane (Nawaal.Deane@uct.ac.za).